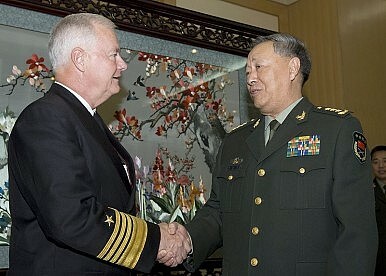 The visit by China’s top general to Washington this week is welcome. But real domestic reforms must follow. In a week dominated by news of the IMF director’s apparently sordid behaviour, continued Middle East unrest, and the fallout of the United States’ successful military operation in the now infamous Pakistani city of Abbottabad, the US hosting of China’s top general has received comparatively little media attention. Chen Bingde is the first People’s Liberation Army (PLA) Chief of Staff to make an official trip to the United States in seven years. His visit constitutes a significant improvement in the on again, off again, military relationship between the world’s sole superpower and Asia’s largest rising power. But even if China in the future refrains from expressing its pique by suspending military ties with the United States, enhanced contacts between the US military and the PLA will fail to bring about the mutual understanding and mutual trust that Beijing professes to desire. As I and Michael Green have argued in the past (here and here), China can’t rise and reassure because its political system remains autocratic. One-party rule in Beijing severely limits opportunities to shape Chinese strategic behavior. With civil society underdeveloped and the business sector ultimately dependent upon the state, outsiders can’t influence foreign policy outcomes by cultivating powerful domestic groups in say, the way foreign countries can within the United States. Autocratic government also casts a pall of uncertainty over Chinese intentions that no degree of military exchanges can fully dispel. The PLA’s growing power projection capabilities generate concern because the ambitions underlying them remain uncertain. Military contacts may help on the margins to enhance US understanding, but the Chinese government ultimately decides what information to disclose, creating a credibility gap. Only a functioning free press that can extract information from the government in Beijing and convey it to outsiders would credibly illuminate China’s intentions. Although Chen’s visit is a major and welcome development, if China wants to reassure the United States and others nations about the peacefulness of its rise, stepping up military to military contacts is no substitute for gradual political liberalization at home. Slashing the US defence budget could undermine stability in Asia and US interests there, says J. Randy Forbes. And it could get worse this autumn.